In continuing to keep my nails decent and clothed (i.e. not naked), I tried out a couple of new colors — Essie’s Jumpin Junkaroo (the medium rosy pink) and Revlon’s Cotton Candy (the paler pink, also a scented polish). Both colors have a nice shimmer, but were a tiny bit streaky. Jumpin Junkaroo has a jelly finish, which always looks great in other people’s swatches, but I find it not very pigmented and a little difficult to work with. I only did 2 coats here, but probably could have done with a third. On the scented polishes front, I really have no idea how they work, but that tiny bit of Cotton Candy had me sniffing my nails all day at work today. It smelt so yum, I just wanted to lick it! Luckily everyone was getting over the Monday morning blues, so I’m pretty sure nobody noticed… my sniffing that is, not the licking. Which, just to be clear, did not happen. I have this thing where I sometimes like to match my nail polish to an item that I’m wearing. 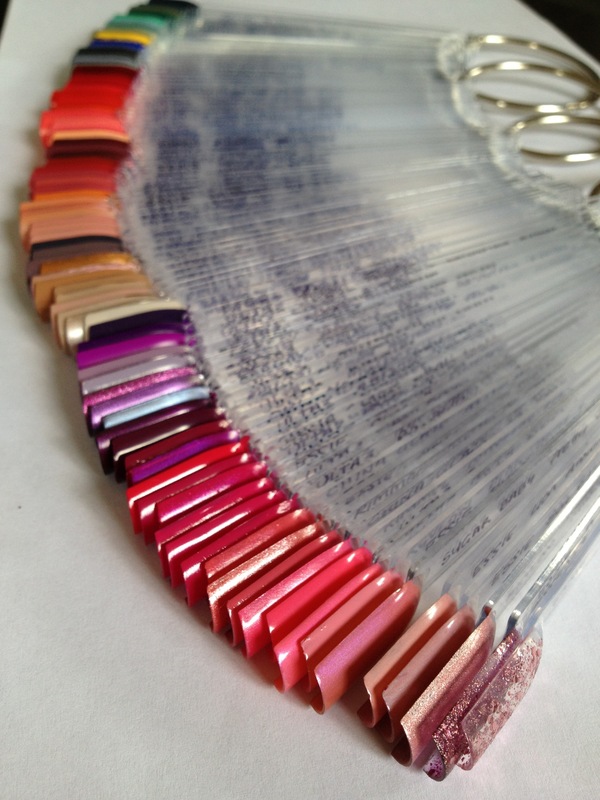 And I have a pretty big collection of nail polish colors, so it’s usually pretty easy, right? But then this one time, I tried to find the perfect raspberry red shade to match my Reed Krakoff bag, but after a good half-hour of comparing bottles I came to the absolutely shocking conclusion that nothing came even close. After the initial shock died away, I knew that this was a problem I wasn’t willing to live with. So, I decided to solve it: Shopparama Style. The key to any good problem solving technique is that you first need to understand the true crux of the issue (this is also how I successfully navigated my three-month shopping ban and came out of the other end victorious with 5 new pairs of shoes, but that’s a story for another day). In this case, as any nail polish enthusiast knows, the color that you see in the bottle is rarely going to be the same color on your nails. What I really needed was a good swatching and cataloguing system, because it is just not efficient to go through 15 bottles only to discover that all the potential pink-leaning reds are actually orange-based (true story). Fast forward a few weeks, a little eBaying here and there (as recommended in Jaztee‘s post), and some incidental fume inhalation later (which was strangely therapeutic), I can now immediately pick out the perfect greige or turquoise or magenta to my heart’s content. For about 8 weeks I had myself half-convinced that maybe — just maybe — I was subconsciously having premonitions. Yes, I thought my dreams were telling me something. Before I go to work each morning, I walk past this tiny corner coffee shop near the train station, which opened up a few months back. But being a bit of a snob, I never gave it much thought because I just could not believe that it’d have good coffee, given its proximity to a local railway station. But then I had this dream where I was searching for Sydney’s best coffee, and some random good looking stranger in my dream (it might have been Matt Bomer) told me that there was a little gem, hole-in-the-wall place he had discovered. And yes, you guessed it — it was that tiny corner coffee shop. Ever since that dream, I’ve always wondered whether the coffee there is any good. After all, I was judging it by its location, but you know what else is from that area? Me! So maybe it was the best coffee ever, and maybe my subconscious was telling me so. After weeks of thinking this, the other day I finally bit the bullet and ordered a coffee. Sadly, I was very disappointed to discover that the coffee was bitter, watery and just generally bad (I got a free sugar palmier which was pretty good though). Do not trust strangers, even if they are a figment of my imagination, no matter how good looking. Essie’s Bangle Jangle is a gorgeous nail polish color, but its cool tones kind of wash me out, so I should stick to using it in gradients, and start hunting for its warmer sister. There are not enough words in the English language to express my devastation. 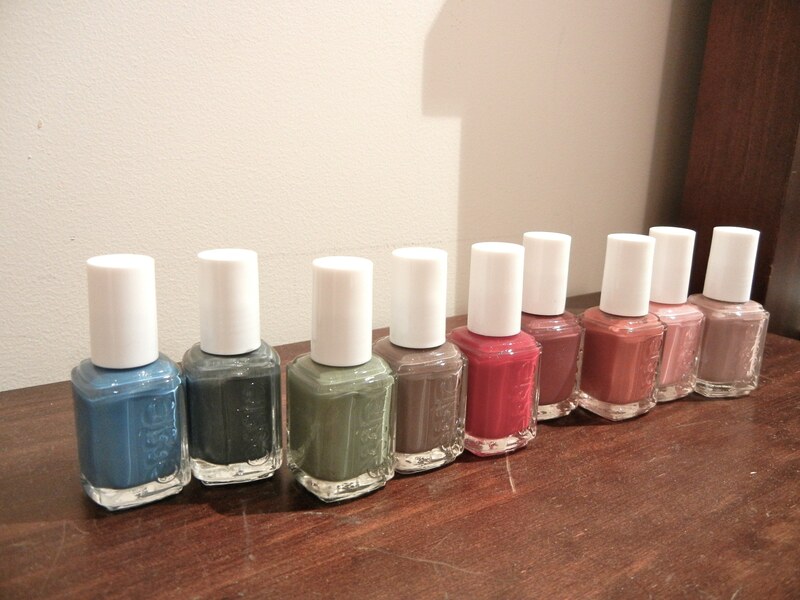 Loot of the day: Essie Mini Color Cubes from the Cosmetic Fragrance Direct store at Birkenhead Point, for only $5 a set! These are normally $25 RRP – what a bargain!!! Well, it’s not a Ryan Gosling hot man-icure, but since today was such a nice, grey, rainy day, I decided to have another go at the gradient manicure! After brushing on base coat, line the sides of your nails with scotch tape. This will make the clean up job after much less painful. Dip your sponge into the bowl of water and pat the surface of the sponge to get rid of any excess water. This will prevent the sponge from soaking up too much nail polish and help transfer the color onto your nail. Using the 3 selected colors, paint 3 stripes onto the wedge sponge, with the color you want on the end of your nail at the edge of your sponge. 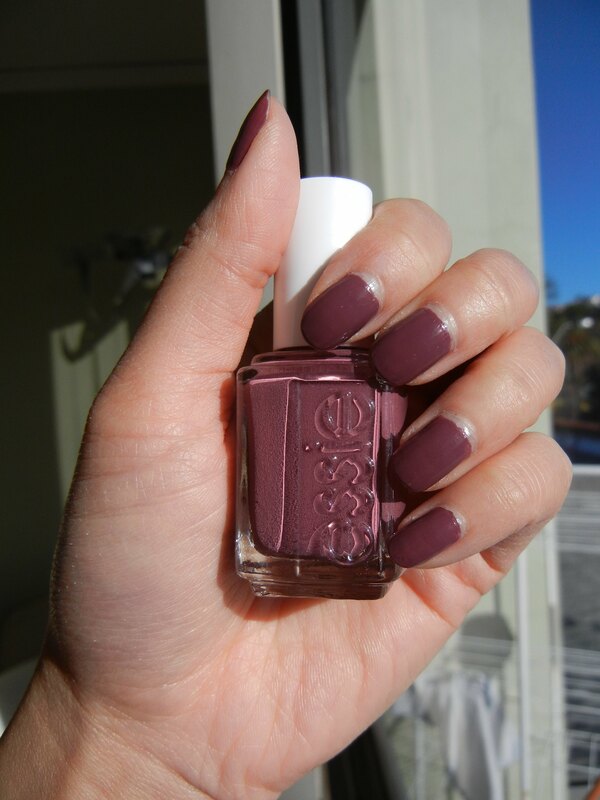 Use a lot of polish, otherwise the first coat on your nails will look very sheer. Lightly bounce the sponge a few times onto a piece of paper, making sure to wiggle the sponge a little to blend the colors. Bounce the sponge a few times onto the surface of your nail. If the 3 stripes of color are still very separated, shift the sponge up and down your nail as you bounce the sponge to further blend the colors. If you use enough nail polish on the wedge sponge, you should be able to do 2-3 nails without reapplying polish on the sponge. Make sure that the sponge doesn’t dry out too much, otherwise bits of the sponge will be left on your nail! Remove the scotch tape. Remove any nail polish left on your skin with a paintbrush dipped in nail polish remover. I find this more precise than using a cotton tip. Apply top coat to seal it off, and then you’re done! As a final tip, I would definitely choose the colors carefully — my first attempt was green/grey and looked horribly ghoulish! One of my favourite ‘wind down’ activities is to watch TV, but you know, sometimes TV shows are so ridiculous! I can’t believe that Chuck and Blair just blah blah blah’d again! And Alicia Florrick, how can you be so smart but raise such annoying kids? So, to help with the whole suspension of disbelief or irritation, I paint my nails. It’s become a slightly expensive way to watch TV, so I’m often on the hunt for cheaper places to buy my go-to nail polish brands, Essie and OPI, which retail for around $20 a bottle. From left to right, the bottles are: Coat Azure, Fair Game, Sew Psyched, Merino Cool, A List, Angora Cardi, In Stitches, Flawless, Demure Vixen. So far I’ve only tried tried Angora Cardi (this photo was taken when the polish was about 5 days old, so please excuse the chips!) and Merino Cool (which is actually more purple-grey in real life). The order from nailsupplies.us costed US$4 a bottle (but for some reason you have to create an account and log in to see these prices), plus US$20 flat rate shipping for the 9 bottles. They also sell OPI for $6.80. The other took forever to arrive, but it was well packed and arrived undamaged. The other place I get my nail polish is ProNail Supply in Bankstown, where I always spend at least 1 hour and $60, without fail… but since it’s in person at least there aren’t any postage fees!